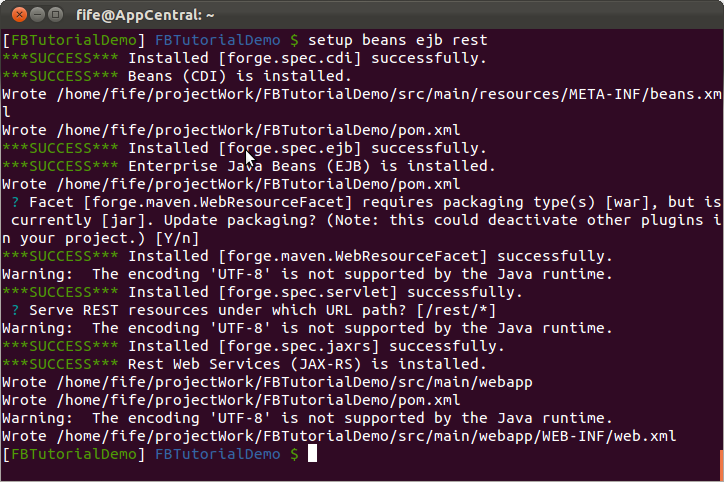 JBoss Forge is an incredibly powerful tool for creating new applications; it’s possible to set up much functionality very quickly. We’re going to tap into only a small fraction of its extreme powers to jump start our Facebook app. If you don’t have your Forge console open, run Forge by opening a new terminal and typing forge. Once it’s is running, you can hit <TAB> at any time to see auto-completion suggestions. If you get an error saying forge is not a recognized command, make sure you have correctly installed Forge. Re-run your profile, and try to open forge again. Forge will then ask you if you also want to install extended APIs, you can use the default of ‘No’ (just hit <ENTER>). You should then see confirmation that Forge wrote pom.xml and persistance.xml. We will now continue to create several @Entity objects to store Users having a facebookID:long, name:String, and imageURL:String. These will represent any/all basic Facebook Users; our players and each of their friends will be set up as a User. We’ll also create a Player object having a playerInfo:User, points:long, and friendList:ArrayList<Long> (to store FacebookIDs of all the friends of that User). In the Forge window type the commands to set up our User object, results should look something like this. If you get stuck, remember to press <TAB> to get Forge to give you hints on what to type next. Now create the Player object in the same fashion. Be aware that the playerInfo and friendList fields have to be set up a little differently because of their non-native types. We are now ready to check our pulse. Make sure things work so far by using the build command. You should see this. If you are using Forge, you may perform this entire step by using the following command. Here we instruct forge to set up CDI, EJB, and JAX-RS (REST) and specify that we want to use /rest/* as the root URL from which REST Endpoints will handle requests. Forge may ask you to update the packaging to a [war] file which is what we want, so hit <ENTER> to accept the default. We also need to specify a REST endpoint. We again want the default of /rest/* (hit <ENTER> again). Literally speaking, <url-pattern> tells our application that we want to use JAX-RS, and specifies which requests will get routed to our endpoints. In this case, any request with a URL like http://yourapp-yourdomain.rhcloud.com/rest/*anything* will get caught and routed to our REST services. Your POM file may contain different dependencies depending on whether or not you used Forge to set up your project, and which Forge version you’ve used. But the key point is that you need to have the JAX-RS, JPA, and CDI API libraries available for your project to compile. At present, the current configuration of JAX-RS is assuming (and requiring) that you have a class set up with a @Path defined. Since we need to define where we are going to route our requests when they hit our servlet-mapping of /rest/*. For now we can simply create a shell of our WebService class, but leave the implementation for a later article. If you had any trouble following along, simply grab the code to this point from github tag: v0.1.zip — Setup CDI, EJB, and REST. Now that we have a few @Entity objects in our project (even if it doesn’t quite do much at the moment), our next step is to host it somewhere. If you’d like, you can simply host it on your local machine at http://localhost:8080/, but we’re going to take you through setting up an account and hosting at Red Hat’s OpenShift platform which is completely free. The huge benefit here is not having to worry about blackouts, or just needing to restart your machine for some reason, as well as giving your site more dedicated bandwidth. OpenShift also offers options to expand on size and bandwidth from their free version if/when your app takes off. Go to: https://openshift.redhat.com/app/ and click the button to “Sign up and try it”; make sure to provide all of the necessary fields. OpenShift will then send you an email to the address you provided them. You’ll have to click the link in the email to validate your email address with them, retype your password, and sign in. Once logged in, you’ll need to accept the legal terms. You can continue to follow this guide which will show you how to deploy your newly created app to your OpenShift site. 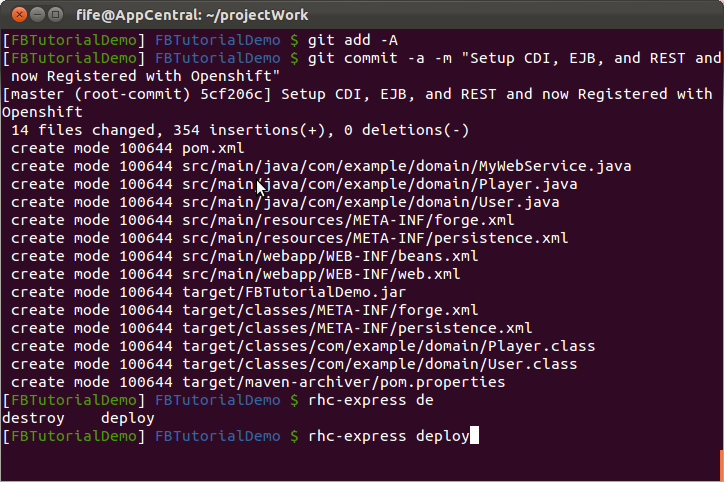 If you feel like doing things the complicated way, you can also follow OpenShift’s own quick start guide here, without Forge. You will need to re-type your OpenShift account information into the Forge console. Also note that it may take several minutes to complete this process. Make sure any time you are trying to save/upload changes that you are adding and commiting from the root of the .git repository (aka the project folder) to ensure all changes in the project get updated. These commands will mark all files to be sent to the server, set the messages associated with this particular commit, and then upload the new git repository, build, and redeploy the application to the cloud for us in mere seconds! If you’d like, you can also store your code on GitHub as well, like I’ve done. Once you have created a GitHub account, and a new project to contain your code, you can push your code with just a few commands. git commit –a –m "Description of change"
We’re going to do some fine tuning, adding specific code blocks to our project, and while some of these things can be done within Forge, it’s easier to use a full graphical editor for this step. 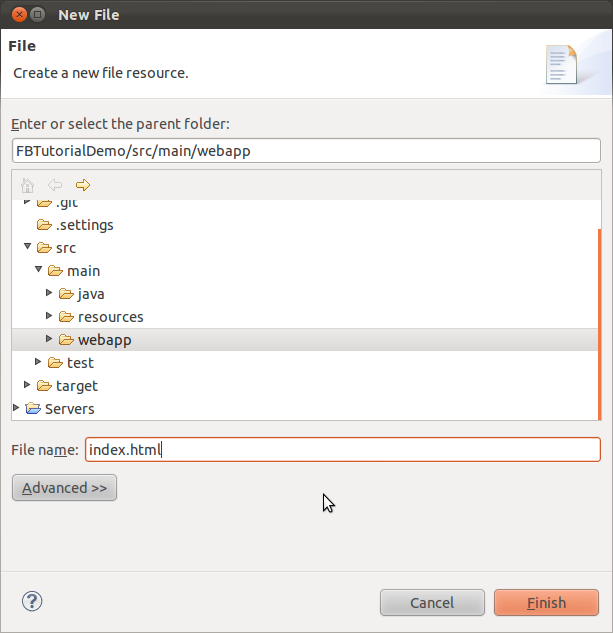 If you created your project using Forge from within Eclipse, you can skip this step; otherwise, we need to import our project into the Eclipse workspace before moving forward. 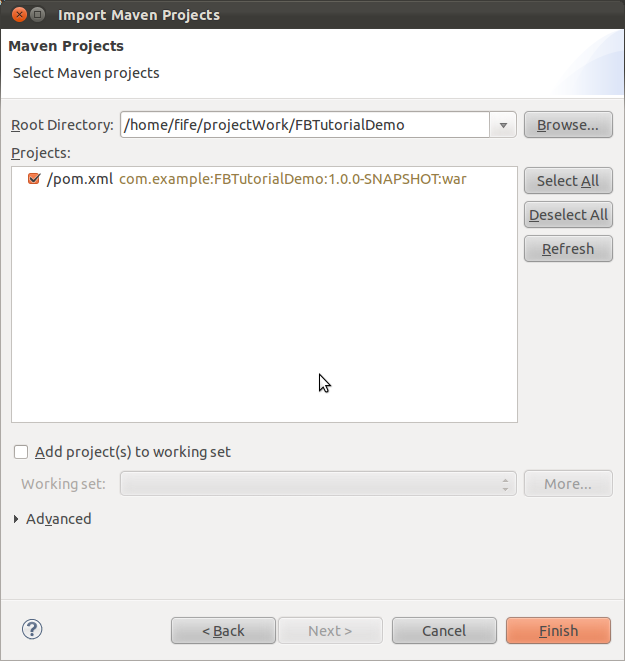 Open Eclipse and Click File -> Import -> Maven -> Existing Maven Projects. Browse to the maven project, import it, and create a new file called index.html in the scr/main/webapp directory. (If the file already exists, you may simply delete its contents and replace them with the following HTML snippit.) This file will greet our users when they access our application. The above simply displays a heading welcoming you to the Tutorial Demo. 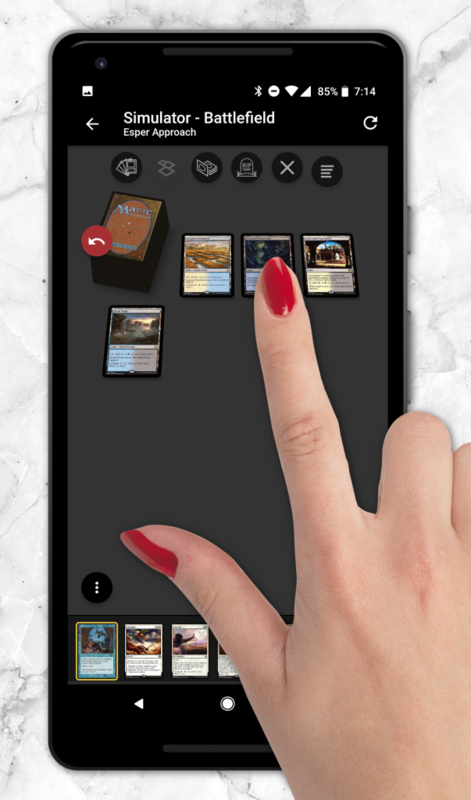 We can now use this to confirm that our app is being loaded correctly. Save point – don’t lose your work! Make sure to replace “yourapp” with your application name, and “yourdomain” with your OpenShift domain name. If you had any trouble following along, simply grab the code to this point from github tag: v0.2.zip — Test your cloud connection. Go back to the Facebook app page at: https://developers.facebook.com/apps Click the “Edit Settings” link (near the top right), and enter your OpenShift application’s web address into the Canvas URL and Secure canvas URL. OpenShift lets you use http:// or https:// to access your app through non-secure or secure respectively. We can get anyone’s FB profile image with their ID using the GraphAPI as the code does by using “https://graph.facebook.com/response.id/picture”. // then start a new row. tableString = tableString + "<td>"
If you need more test-data, you can always register test users and friend them (all you need is an email address for each one which you can keep getting from gmail or other email providers). This is a good time to upload your changes to OpenShift and have it rebuild and redeploy these new files out to the facebook canvas site for us. Once you get the new index and 2 new pages working, you can move on. If you had any trouble following along, simply grab the code to this point from github tag: v0.3.zip — Add Facebook connectivity. Now that we have some minimal Facebook functionality on our site, our next article will dive into some of the slightly more advanced topics such as setting up our game logic, handling players, and saving information to our database. Players will be rewarded points for correct answers, and deducted points for incorrect answers. Please watch our RSS feed and follow us on Twitter @ocpsoft to receive notifications of new articles. Incredible. I love the break down. Very organized and able to be understood. Hopefully more folks will start getting involved with the creation of apps on not only Facebook but the iPad and iMac’s too. hi, very nice tutorial, thanks! i think the forge command for creating the persistence.xml is wrong. Figured out some things, including addind a ssh key to the openshift account. it has to do with mongodb being used but i don’t get the message. Glad to hear you got the OpenShift ssh keys set up. OpenShift does support MySQL 5.1, PostgreSQL 8.4, and MongoDB 2.0 databases, so you should be ok there. I’m not all that familiar with MongoDB, but this does appear to be a Mongo error. Without seeing more of your code, there’s not much at all I can do for you here, and as I mention, I’m not really familiar with that technology anyway. I would recommend searching Google for the error, if you still need help, (or instead of google) search StackOverflow. The following article looks like he has the same error as you: StackOverflow entry. If that didn’t help, you can always create your own StackOverflow account and post some of your code and the question there. You should get someone more familiar with MongoDB to help you figure it out very quickly on that site. somehow it started to work. As a test i create another project through the openshift console. Hi, thanks for writing this great HowTo. I could follow each step as you described but got stuck when it came to rhc-express setup. When I enter the (correct) credentials (bad ones are recognised) there’s just no further output in the console and I’m taken back to the command prompt. After doing so, git won’t work because there was no repository created. Do you have any idea how to fix this problem? Try going directly to OpenShift and click SIGN IN TO MANAGE YOUR APPS in the upper right corner. Try those same credentials. If you’re not able to get on, you can try the forgot password link, and have OpenShift reset your password. If it doesn’t even recognize your Email as being registered, try re-registering with OpenShift again, and then try the rhc-express setup again after that. If you’re getting to the point where its asking for credentials after the setup command, then the OpenShift-Forge plugin should be installed correctly, from there it’s just up to OpenShift to validate you with the credentials you supply. You probably also want to check that it’s not one of the common pitfalls of capslock or numlock being set to something other than you expect, since you can’t actually see the password you’re entering. thank you for your answer although it didn’t help me to proceed. This is what I get in the eclipse forge view. I didn’t enter anything when it asks me for the application name and just pressed Enter. As you can see if I try it a second time it’s not asking for the username anymore but still no output and after those steps rhc-express destroy/deploy is not available. Hi. It’s possible that the openshift plugin needs to be updated. Try reinstalling it in Forge. I know that there was some work being done on it in the past few days. I’ll try to see if anyone else has been having similar issues. Hi, i need help with Forge, that is not so well documented. I’m not able to reopen a project and continue the setup that i had to stop. What do I do for the two [FBTutorialDemo] [FBTutorialDemo] ? It’s all failed at this point! Connecting to remote repository [https://raw.github.com/forge/plugin-repository/master/repository.yaml]… connected!